Editor's Note: The Kahn exhibit discussed here will be at the Brattleboro Museum & Art Center only through November 12, but a fund-raising raffle for a Kahn barn pastel and other prizes will continue through the drawing date of January 5, 2007; tickets at $25 ea., 5 for $100, are available at the museum or online at www.BrattleboroTix.com. Wolf Kahn's current exhibit, "Landscape of Light, 1953-2006," at the Brattleboro Museum & Art Center, curated by Mara Williams, is a rare opportunity to see a collection of works spanning half a century by a living Modern Master painter who uses the landscape as his muse. Although the artist has kept a residence in the area since the late '60s and paints throughout the warm months locally, this is the first show of major paintings to be mounted in town. Wolf Kahn has iconic and near legendary stature among the area's population of landscape painters and lovers of landscape. There is, perhaps, a school of artists here who are strongly influenced by Kahn (we wouldn't think of listing them! ), while many artists who paint otherwise speak of having to "deal" with Wolf Kahn, meaning that his influence is so strong it cannot be ignored. At the moment, we may study it. When Wolf Kahn entered the art world, the over-arching influence of Pablo Picasso on most artists was undeniable. The abstract expressionists were at the crest of the wave, and many of them -- such as Jackson Pollock, Arshile Gorky, and Willem de Kooning -- had "come out of" Picasso to discover their respective abstract styles. Picasso, for his own part, had emulated many of his strong contemporaries but was unable to enter the age of pure abstraction by giving up reference to any image, an idea which had been opened up by the surrealists. An early Kahn figurative work, "Portrait of Frank O'Hara," 1953-54, uses a close focus on the sitting figure, a subject the great Spaniard was obsessed with, while the subject matter, a slightly quirky interpretation of a contemporary poet, is also very Picasso. A link to Picasso's friend and contemporary Georges Brach can be seen in one of the books about Wolf Kahn's work available at the Museum. "Still Life in the Style of Brach," 1947-48, is "plate one" in the large published collection by Justin Spring entitled Wolf Kahn. Kahn created a painting in 1951 entitled "Soutine's Influence," and he is fond of citing his teacher Hans Hoffman as an influence, but when all is said and done, the artist he may be closest with is Pierre Bonnard. 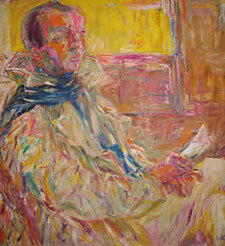 Only in Bonnard can we find color which simultaneously seems to "hold" light while being fully exploited for all its subtle richness and contained in a sympathetic view of nature (though Bonnard chose to paint less landscape and finally focused on depicting his model in the bath engulfed in light and sensual color). There is a similarity also in the developed color palettes of the two artists, a palette of yellow-golds, orange-pinks, mauve-purples, and turquoise-greens in subtle tonal relationships. In Kahn, we also see warm earth tones and cool, cool, misty cobalts and grays. Chronologically early works in the Museum seem to show a consideration for pure abstraction given up in favor of the image. 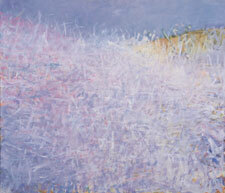 "The Further Shore," painted in 1960, is a mid-tonal arrangement of brush strokes, which creates an atmospheric foglike effect. Color is merely implied in this orchestration of grayish tones. A spatial quality is apparent, but shallow. We cannot see the "further shore" because the fog obscures it. (The title of this work will be discussed for its ironic content later on.) Three small canvases painted between 1960 and 1966 seem to show a shift in attitude. The first is "Tree Trunks." This composition seems like the marriage of Mark Rothko with Louis Morris. Strong vertical brush strokes, large enough to be called shapes, overlap as they line up across the horizontal format of the small canvas. Next, "Italian Farmhouse" is a series of small rectangles, again arranged horizontally and painted expressively. One could say that these two pieces show an awareness of minimalism, or that they strive for tonal explorations of impressionist subjects, but really, without the titles we would never know they are landscapes. They are abstractions with landscape titles. The third in the set of three then breaks from such formal thought (without changing tone or palette) and allows the image of a sailboat to be a sailboat. This small, simple sailboat, seen at late dusk on the water in semi-darkness, is symbolic. At the time, the notion of painting from life was indeed unpopular, as leading artists were identifying with new conceptual schools of art, such as abstract-expressionism, minimalism, pop-art, installation-art, and performance. The move was away from depiction and the use of image as a conduit for expression. Two-of-every-conceptual-posture climbed aboard the Modernist Ark as the flood of criticism covered a history of image making. A solitary sailboat charted its course for something like Henry David Thoreau's "road not taken." At the tiller sat Wolf Kahn. "First Barn," 1966, established the artist as a landscape painter, simultaneously showing how Kahn was able to pull notions of his abstract contemporaries into the format of landscape as expressive, painterly devices. This first large barn as subject was the forerunner for many paintings of barns the artist was to make. The form of the barn works as a large, looming shape, dominating a picture by its bulk and presence. It is these abstract qualities which carry the real meaning of the painting for the artist -- also, the barn as an empty vessel, like the artist-as-vessel to be filled and emptied again and again (not with hay! 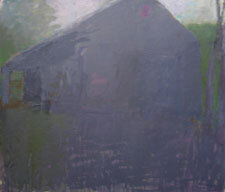 ), or the presence of the barn itself, its calm, powerful entity, quiet and dominant, as an expression of identity. But by imbuing the contents of this depiction with such qualities, qualities found in Rothko's large shapes, Guston's painterly touch, or de Kooning's rush of painted gesture, Kahn not only brings such visual elements to his work but retains the literally metaphoric content available when considering an image. That type of content goes when the literal image goes and is of course lost from pure abstraction. In "The Yellow Square," 1981, we have skipped fifteen years, and strong picture making has become a priority. 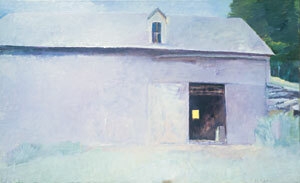 Within the pictured barn, the light shining through a small window is a pure yellow rectangle, a reference that seems to point directly back to the color rectangles of Hans Hoffman. When we lose the barn and its strong iconic presence, we may have not gone far, perhaps just across the pasture, but a different element of the artist's personality becomes apparent. 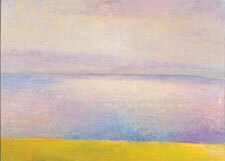 Wolf Kahn's landscapes are first about color, and most agree that this color has strong emotional character. No, this is not Vlaminck or Nolde, where paint is fire and wind, or longing and sorrow. Kahn's canvases never contain angst. Tonal subtleties stretch to find the point where color leaks into ecstatic harmony or acidic dissonance. One cannot escape the conclusion that Wolf Kahn believes in Beauty. (Let the camps fall where they may. . . .) Those whose eyes tear up when they see their favorite Wolf Kahn painting are the same who tear up at a good sunset. And so it is, travel as you will throughout this country, that you find his admirers everywhere. Like the 86-year-old author Edward Gormley in rural Pennsylvania, who, when asked about his ideas on art, said: "I'm a Wolf Kahn man." Now, exploring the subtle beauty of color in nature as an impetus for expressive painting is something that could take a lifetime. And then he picks Vermont. Of course, the artist has painted many seascapes and even traveled down the Mississippi River in search of compositions, but it is here, where he is currently artist laureate (so named by the governor), in the Green Mountain state, that he found nature with an open paint box. And the phenomenal color to inspire him. Actually, this year's foliage couldn't have been nicer as a backdrop. Along with the paintings of barns he is well known for, within the overall body of work two or three other compositional themes emerge as being very representative of this artist. One of these was referred to earlier as the title of a work from 1960, "Tree Trunks." The image of a horizon beyond tree trunks, or the light as it disappears into thickening trunks at dusk, or tree trunks as expressive vertical gestures in paint, the theme is repeated over and over. In the back gallery was "Blue Ridge in the Distance," 2005. This painting is a simple celebration of this pictorial device. The viewer stares into the distance, out, towards the landscape from just within the edge of the woods. Beyond is a pasture of baked golden grass, tinged with sunset light and rolling along to where it falls off, giving way to a distant blue hill. Above this is a "pinking" pale sky telling us that stronger colors will come soon, before night. All this is seen through the tree trunks and their branches, which barely separate us from stepping into the field. The bases of the trunks begin to hold shadow in the dimming light at day's end and above take on a ghostly, grayish hue. Below, the red of dried pine needles glows darkly. Anyone who has walked in the woods knows that you must watch the ground as you go, keeping an eye to deflecting branches. But as you approach a breach in the forest, you look up, just before exiting, and this type of view occurs. 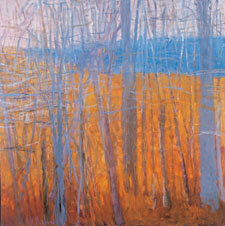 In this work the colorist allows the trees' branches to become another expressive element. The gestured strokes weave back and forth across the canvas, intertwining with the saplings and trunks; they could almost be trails left in water from darting fish. But they are branches, that is, brush strokes . . . well, you pick. The question of whether to use landscape to "capture" a moment, place, or light thereof, or whether to use it as a means to deliver personal self-expression, is one of the philosophical forks in the road for some landscape artists who choose one or the other. Kahn seems to be well aware of the question and quite satisfied not to answer it. Color can be subservient to place, or place subservient to color. Image can be subservient to abstraction, or abstraction subservient to image. All could have come from nature or from the artist's process. That's the game, so to speak. Find the painting. 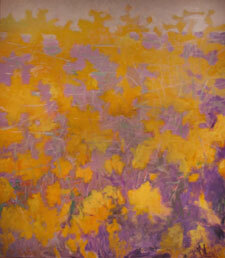 Another large work in the back gallery was called "Big Yellow and Violet Painting." Now we have a landscape with an abstract title. O.K. There might be a question here of whether these bouncy, popcorn-like shapes of golden paint on a purple ground (which ascends to softer violet behind) were part of a patterned abstract composition, were it not for the horizon. At top, the small band of pale blue sky brings us back to reality. Calm down, those are trees. Well, again, no. Those are fluffy, amorphous shapes patterning a surface. And this is another of the abstract devices used again and again in compositions depicting fall foliage. 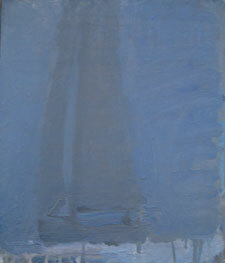 At the back of the gallery hangs a painting not to be missed: "Calm Sea," 1995. Here is a great example of how Kahn captures an effect of light. Shimmering reflection is caught in the short marks of pink and blue which describe the sky and sea. The eye shifts back and forth while the viewer excitedly realizes that the artist has caught the real effect of inter-reflection between above and below. There are moments in the passing flight of nature which stun the senses, as the one depicted here. This would be a good time to conclude this review, making a final reference to the most recent piece using the tree-trunk theme in the main gallery, entitled "Dark Trunks." This is a fantastic painting. Romantically deep in tone, the black trunks fall in a cascading pattern from upper left and become engulfed in darkness at the center. The darkening forest creates a great looming shape while around it, and beneath, bright light seeps into the scene with sensuous color. But we can't stop here because something has happened. To the left of the previously mentioned piece is another large painting, from 2004. It is called "Vertical Chaos Painting." This large work is like a snowstorm of gestured marks and brush strokes. Dominated by the color white, the main elements of the Wolf Kahn palette squeeze through just here and there. This is a work to be seen in person. You might conclude, as did this reviewer, that now we can perhaps see that "further shore" obscured by the fog in 1960! Actually there is an even closer affinity between that early work and one more recent, "Tangle with a Pink Tinge," 2006. But there is something going on in the two later paintings, which relate right back to the earlier work. Since conspiracy theories are popular these days, we might call it the "revolution of the marks." Simply put, in these new works it seems as if the presence of place has been nearly lost in favor of intuitive improvisation and instinctive patterning with ordered brush strokes, resulting in an abstract composition informed by nature spatially and in palette color. If it weren't for that hint of horizon and bit of sky at the top . . . goodbye, landscape. Well, it's for you to decide, and that might be the way the painter would rather have it. But one thing is for sure: In the beautiful land of Vermont, where the apple blossoms open up the Spring, where deep evening light can seem to have mellowed like good wine, and where the Autumn hills are a dancing fire before the eyes, Kahn is King!